Ohaus CS CL Carry CaseCarry Case for Ohaus CS and CL balances. Ohaus Defender 3000 D31P150BL 16x21 300 lb.D31P150BL Ohaus Defender 3000 Series 300 lb. capacity Bench Scales with 16.5 x 21.6" platform have been designed as reliable and affordable scales for use in production, packaging, and shipping and receiving areas. The Defender 3000 Series feature a simple, yet rugged, tubular-frame base design and indicators with tactile keys, backlit LCD display, built-in rechargeable battery operation and flexible mounting capabilities. Ohaus Defender 3000 D31P150BX 19x25 300 lb.D31P150BX Ohaus Defender 3000 Series Bench Scales with 300 lb capacity have been designed as reliable and affordable scales for use in production, packaging, and shipping and receiving areas. The large 19.7 x 25.6" platform Defender 3000 Series feature a simple, yet rugged, tubular-frame base design and indicators with tactile keys, backlit LCD display, built-in rechargeable battery operation and flexible mounting capabilities. 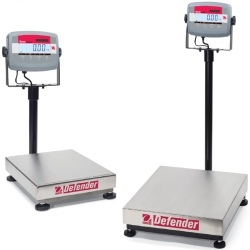 Ohaus Defender 3000 D31P300BX Bench Scale 600 lb.Ohaus Defender 3000 D31P300BX 600 lb. capacity Bench Scales with 19.7" x 25.6" platform have been designed as reliable and affordable scales for use in production, packaging, and shipping and receiving areas. The Defender 3000 Series feature a simple, yet rugged, tubular-frame base design and indicators with tactile keys, backlit LCD display, built-in rechargeable battery operation and flexible mounting capabilities. Ohaus Defender 3000 D31P30BR 12x14 60 lb.Ohaus Defender 3000 D31P30BR Bench Scales have been designed as reliable and affordable scales for use in production, packaging, and shipping and receiving areas. Cap: 60 lbs Platform: 12x14. The Defender 3000 Series feature a simple, yet rugged, tubular-frame base design and indicators with tactile keys, backlit LCD display, built-in rechargeable battery operation and flexible mounting capabilities. Ohaus Defender 3000 D31P60BL Economy Bench Scale 150 lb.Ohaus Defender 3000 D31P60BL Economy Bench Scales are ideal for many straight-weighing applications where only gross weight reading is required and where economy is important. Cap: 150 lbs Platform: 16.5"x21.6"
Ohaus Defender 3000 D31P60BR 12x14 150 lb.The Ohaus Defender 3000 D31P60BR Bench Scales have been designed as reliable and affordable scales for use in production, packaging, and shipping and receiving areas. 150 lb capacity with 12x14 platform. The Defender 3000 Series feature a simple, yet rugged, tubular-frame base design and indicators with tactile keys, backlit LCD display, built-in rechargeable battery operation and flexible mounting capabilities. Ohaus Defender 5000 Low Profile 250 lb.Ohaus Defender 5000 Low Profile Bench Scale, model D51P100HL5 is NTEP Legal for Trade. Platform: 16"x20". Cap: 250 lbs. Ohaus Defender 5000 Low Profile NTEP Scale 30 lb.Ohaus Defender 5000 Low Profile Bench Scales with 30 lb. capacity, model D51P15HR5 is great for shipping and other general weighing needs, the Defender 5000 Bench Scales are just right for your application and budget. 12" x 14" base. Ohaus ES100L Bench Scale 220 lb.The Ohaus ES100L bench scale features easy, two-button operation and battery power in an economical bench scale design. For weighing in kg, lb, oz or lb:oz., the ES series provides a plug-n-play bench scale with stainless steel 20" x 16" platform and black painted frame. Cap: 220 lb. Ohaus ES200L Digital Scale 440 lb. 20"x15"The Ohaus ES200L scale features easy, two-button operation and battery power in an economical bench scale design. For weighing in kg, lb, oz or lb:oz., the ES series provides a plug-n-play bench scale with stainless steel 20" x 16" platform and black painted frame. Cap: 440 lb. 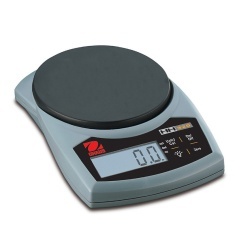 Ohaus ES30R Bench Scale 66 lb.The Ohaus ES30R series features easy, two-button operation and battery power in an economical bench scale design. For weighing in kg, lb, oz or lb:oz., the ES series provides a plug-n-play bench scale with stainless steel platform and black painted frame. Cap: 66 lbs. Ohaus ES50L Bench Scale 110 lb.The Ohaus ES50L bench scale features easy, two-button operation and battery power in an economical bench scale design. For weighing in kg, lb, oz or lb:oz., the ES series provides a plug-n-play bench scale with stainless steel 20" x 16" platform and black painted frame. Cap: 110 lb. 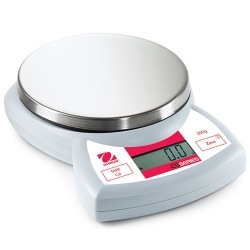 Ohaus ES Digital Bench Scales 12"x10"The Ohaus ES series features easy, two-button operation and battery power in an economical bench scale design. For weighing in kg, lb, oz or lb:oz., the ES series provides a plug-n-play bench scale with stainless steel 12" x 11" platform and black painted frame. Cap: 110 lb. 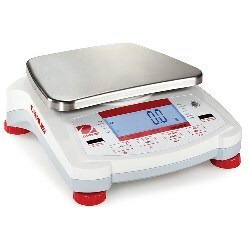 Ohaus ES6R Bench Scale 13 lb.The Ohaus ES6R series features easy, two-button operation and battery power in an economical bench scale design. For weighing in kg, lb, oz or lb:oz., the ES series provides a plug-n-play bench scale with stainless steel platform and black painted frame. Cap: 13 lbs. 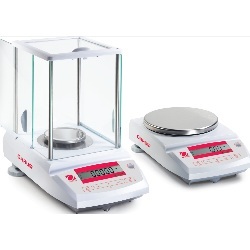 Ohaus NVT10001/1 Portable Scale 10kgOhaus Navigator XT 10,000 gram balance NVT10001/1 offers a superior mechanical overload protection system that enables the scale to safely bear loads up to four times its rated capacity. This is a scale built to withstand serious loads but light enough to carry. The high-strength 304-type stainless steel pan and impact-resistant ABS plastic housing allows the Navigator to stand up to years of use. The innovative touchless sensors minimize the need to press the keypad with your hand, a knife or any sharp object, reducing wear and tear on the keypad, and increasing the effective life of the scale. Ohaus Navigator NVT16000/1 Portable Scale 16kgOhaus NVT16000/1 offers a superior mechanical overload protection system that enables the scale to safely bear loads up to four times its rated capacity. This is a scale built to withstand serious loads but light enough to carry. The Navigator XT's high-strength 304-type stainless steel pan and impact-resistant ABS plastic housing allows the Navigator to stand up to years of use. The innovative touchless sensors minimize the need to press the keypad with your hand, a knife or any sharp object, reducing wear and tear on the keypad, and increasing the effective life of the scale. Ohaus Navigator NVT1601/1 Portable Scale 1600gOhaus NVT1601/1 offers a superior mechanical overload protection system that enables the scale to safely bear loads up to four times its rated capacity. This is a scale built to withstand serious loads but light enough to carry. The Navigator XT's high-strength 304-type stainless steel pan and impact-resistant ABS plastic housing allows the Navigator to stand up to years of use. The innovative touchless sensors minimize the need to press the keypad with your hand, a knife or any sharp object, reducing wear and tear on the keypad, and increasing the effective life of the scale. Ohaus NVT3201/1 Portable Scale 3200gOhaus NVT3201/1 offers a superior mechanical overload protection system that enables the scale to safely bear loads up to four times its rated capacity. This is a scale built to withstand serious loads but light enough to carry. The Navigator XT's high-strength 304-type stainless steel pan and impact-resistant ABS plastic housing allows the Navigator to stand up to years of use. The innovative touchless sensors minimize the need to press the keypad with your hand, a knife or any sharp object, reducing wear and tear on the keypad, and increasing the effective life of the scale. 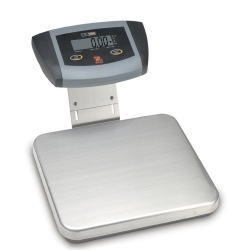 Ohaus NVT6401/1 Portable Scale 6400gOhaus NVT6401/1 offers a superior mechanical overload protection system that enables the scale to safely bear loads up to four times its rated capacity. This is a scale built to withstand serious loads but light enough to carry. The Navigator XT's high-strength 304-type stainless steel pan and impact-resistant ABS plastic housing allows the Navigator to stand up to years of use. The innovative touchless sensors minimize the need to press the keypad with your hand, a knife or any sharp object, reducing wear and tear on the keypad, and increasing the effective life of the scale.